After the dismall failure of the Windsors' "It's a Royal Knockout", Prince Edward (renowned for his ability to make ratings winning TV programmes) has just bought the rights to a new game show. 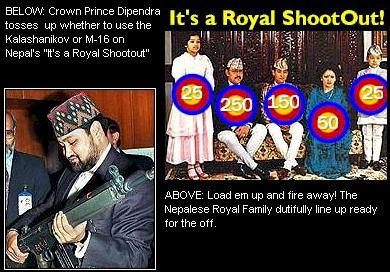 Imported from Nepal, the show - entitled "It's a Royal Shootout" - will see a member of Royal Family equipped with a high- powered machine gun which has a tendency to go off accidentally. Other members of the Royal Family will seek cover wearing large foam rubber costumes - they will be awarded points for spilling as little blood as possible whilst Stuart Hall will giggle like a drunken schoolgirl. TV experts have likened the game to It's a Royal Knockout but with the addition of a sudden-death eliminator. The game ends when all of the members of the family are dead at which point the gun toting royal has the option to gamble russian-roulette-style. The show's run came to a premature end in Nepal after Crown Prince Dipendra opted to gamble after just missing out on winning the caravan. He had shot two of his sister's whilst they slept but the games rules clearly state "you don't get anything for 2 in a bed". Dipendra then elected to "ask the audience" but he had shot most of them already.